Smart lighting is the next big thing, they’ll have you believe – which means the market is literally flooded by light bulbs with embedded wifi chips, all with their own silly mobile app that you need to fuss around with just to turn them on. Call me a skeptic, but most of these are an utter waste of time. Is Philips Hue any different? Today I’ll be finding out, and at the end of this review you can enter to win your own Hue starter kit. Phillips Hue isn’t the only smart lighting system out there, but it is the most widely supported by various smart home hubs Battle of the Smart Home Hubs: What's Out There and What's Coming? Battle of the Smart Home Hubs: What's Out There and What's Coming? Read More , with promised support for Apple’s HomeKit and Google’s offering – and it’s the only system with such a wide range of software options to interact with and control the lighting – from simple wifi apps to sound reactive music players and even a Disney storybook. We’re looking today at the standard starter kit (“A19-Starter” is the SKU) which comes with three of the original Hue bulbs, available for $190 (in frustration-free packaging). There are now a range of starter kits available, though. If you want something that comes complete with fixtures, you can buy one that includes two Bloom mood lamps for $180. The new Lux bulbs don’t do colour but are otherwise compatible and still come with a base station – a starter set with two of those is only $100. For children, the Disney StoryLight starter pack is $130. In this review, I won’t be comparing the Hue to other smart lighting systems, because the truth is that there simply is no comparison to make. If your needs extend only as far as networked wifi control (and I use that term lightly, because who really “needs” to turn their lights on over wifi?) then the Phillips Hue system is completely overkill. You can buy some basic smart plugs to do that much and pay a lot less. Where Philips Hue really shines (fair warning: the puns aren’t going to stop anytime soon) is in the wide ecosystem created around it. It’s not just a set of plug-in light bulbs with a wifi chip; they also have LED strip lighting for new installations, and a number of branded accessories such as the Disney StoryLight. The API is well developed and easy to work with, which has led to an expansive third party app ecosystem built around the Hue. First and foremost though, the Hue is an accent lighting system. It’d be really tough to replace all your main household lighting with Hue right now, because apart from the sheer overwhelming expense of such an undertaking, they don’t yet produce a bulb with enough lumens to sufficiently light a room to daylight levels. The only thing that struck me about the bulbs themselves is the weight; at 127g each, they’re rather hefty and feel well built. Each gives off about 600 lumens – the highest output of the entire Hue range – but even so, this is only equivalent to about a 40w incandescent bulb. You would need at least 2 bulbs in a central fixture to completely provide for a small room. The Ethernet cable is included because the base station must be wired directly to a network – it does not work over wifi (control via mobile apps is obviously done over wifi, but this is handled by your router, not the Hue itself). The base station – or Bridge, as it is technically known – acts as a central communications point between your home IP network and the ZigBee protocol employed by the Hue. ZigBee has a 10-100m line of sight range depending on the environment and power, but also forms a mesh network, such that intermediate devices can pass the message along until it reaches the intended recipient. Connecting to the Hue for the first time – from either the official app or any third party app – is child’s play. When the app attempts to pair, you press the button – the only button – on the Bridge. That’s it, connected. Each base station can control up to 50 devices. The standard Hue app isn’t all that impressive. The core experience revolves around the idea of static “scenes” – each of which contains one or more bulbs set to a specific colour and brightness. You can give the app a photograph of your own which it’ll attempt to extract suitable colouring from, or use the built-in ones, or just manually specify colours. The app also has a basic alarm functionality with timer, which can trigger or turn off scenes at set times. Finally, there’s a geofencing mode in which you can activate a scene when you arrive at a set location. Again, nothing amazing. The software offers some simple party tricks, but in the grand scheme of an automated and intelligent home it doesn’t really deliver. Philips do however have another in-house integration up their sleeve for owners of Ambilight compatible TVs: the Hue bulbs can be added to the system to further immerse yourself in the on-screen action. I’m almost tempted to buy a new TV, but I might try a Hue connection to my existing DIY ambilight Make Your Own Ambilight for $60 Make Your Own Ambilight for $60 Ambient lighting that reacts to the image on your TV is easier and cheaper than you think - and it makes for a great upgrade to your home cinema experience. Read More instead. After a few weeks of trying out the bulbs in various locations and usage scenarios around the home, I’ve struggled to find long term legitimate uses for them. I had hoped to use them in conjunction with Disney’s Storytime app, which adjusts the lighting to match the scene of whatever page you’re reading; but unfortunately, you need to buy at least one special Disney-branded glorified mood lamp in order to integrate with the rest of the system. To be clear: there’s no technical reason for this. The uplighters are simply rebranded versions of Philips other models – it’s just a money grab. And it worked, because I’ve ordered a StoryLight now too. Sigh. A lot of the time, I found myself turning the lights off at the switch, either from fear of not wanting the phantom electricity being sucked down by every light fixture, or from simple annoyance of selecting a scene resulting in activation of every bulb in the house. Using physical switches to turn off bulbs seems to defeat the purpose of having a smart bulb in the first place. In fairness, third party apps have created grouping functionality. One minor annoyance is the lack of memory in the bulbs themselves: if you set a specific scene, then turn the lighting fixture off and on again, the bulb is “reset” to an incandescent yellowy-white. Most of the time, it feels like the Hue is one part of a bigger puzzle – but you’re missing 70% of the pieces, each new piece costs $50, and then you have to pay extra just to see the picture on the box so you can see how it should all fit together. It’s frustrating, and it makes me want to write an app specific to my needs. … And that’s where I start to see the light, because writing my own app is entirely possible. To its credit, Hue has produced an extensively documented and simple API for third party developers to control the lights, and it’s that which has led to a proliferation of integrations with existing home automation and control systems. It is in fact very easy to manipulate the lighting using standard web requests and a JSON data packet, and I’m sure you’ll hear from me in the future about hooking it up to Arduino. It’s an enlightening attitude for a company like Philips. For a start, there’s an entire Hue IFTTT channel for setting up things like email notifications and weather reports to your lighting. I’m not going to dwell on these, but they certainly shouldn’t be underestimated and could form the basis of your entire smart lighting system. Although I couldn’t get the Disney Storytime app to work, I did find a free LightStories app [No Longer Available] – which albeit limited to a single bulb and with only 3 stories available in the app – was still quite nifty. If someone could set up an open source way to mark-up PDFs and ePub with meta descriptions for suitable lighting, then establish a website where these user creations could be submitted, that would be just great, thanks. You’ll find all sorts of music synthesizers, alarm clocks, replacement controllers and light animators on the iOS and Android app stores Light Your Home the Smart Way With Philips Hue Light Your Home the Smart Way With Philips Hue If you can afford the initial expenditure, you won't find a better-supported and more user-friendly smart lighting system on the market. Read More . I also really enjoyed my time with HueCraft, a Minecraft mod that works with up to 3 Hue bulbs to reflect your current biome and lighting condition in the game. It’s not quite as fun as playing in virtual reality 5 Oculus Rift Gaming Experiences That Will Blow You Away 5 Oculus Rift Gaming Experiences That Will Blow You Away Now that the second generation of Oculus Rift development kit is out and in the hands of developers the world over, let's look at some of the best stuff that's hit the Rift so far. Read More , mind. It’s this sheer diversity and richness to the ecosystem around Hue that makes it a clear winner in the smart lighting Brighten Your Home With Smart Lamps: Here Are Your Options Brighten Your Home With Smart Lamps: Here Are Your Options What exactly is a smart lamp, and what's out there? Read More arena. MakeUseOf Recommends: The best smart lighting out there, but does require effort to integrate exactly how you want. They’re fun mood lighting for the living room or kids bedroom, but expect to be sucked into an entire ecosystem and inevitably spend more. How Do I Win The Philips Hue Stater Kit? 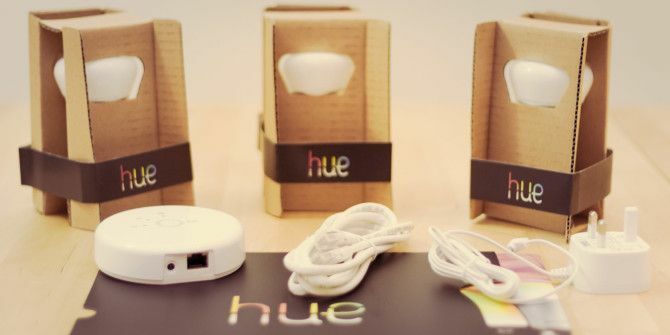 Explore more about: MakeUseOf Giveaway, Philips Hue, Smart Lighting. The one problem with all these new fangled bulbs is that they cannot be used with old fangled clip-on lamp shades. To use all these energy efficent bulbs that are supposed to save me money, I will have to spend a few $hundreds on new laps or lamp shades. I don't see where I will get any savings. Good point dragon. In the U.S., we're just starting to see the classic size and shape show up in stores where we can use our existing lamp shades. I'm not sure about Europe or elsewhere. But you may be able to find them on Amazon. You won't get Philips Hue, but at least you can save some money on electricity. Check out OSRAM brand - their 'Classic A' line is great for old lamp shades.